66 Marlborough is located on the south side of Marlborough, between Berkeley and Clarendon, with First Church Boston to the east and 68 Marlborough to the west. 66 Marlborough was designed and built ca. 1870 by architect and builder Charles K. Kirby, one of eight contiguous houses (66-68-70-72-74-76-78-80 Marlborough) he built between 1866 and 1870 for speculative sale. On November 10, 1870, the new house at 66 Marlborough was purchased from Charles Kirby by architect Gridley James Fox Bryant. Charles Kirby also assigned to him his right to purchase the land at 66 Marlborough from the City of Boston, and Gridley Bryant purchased the land directly from the City. Click here for an index to the deeds for 66 Marlborough. Gridley J. F. Bryant and his wife, Louisa Bryant (Braid) Bryant, made 66 Marlborough their home. They previously had lived at the Tremont House hotel. On October 11, 1872, he transferred the property into Louisa Bryant’s name. 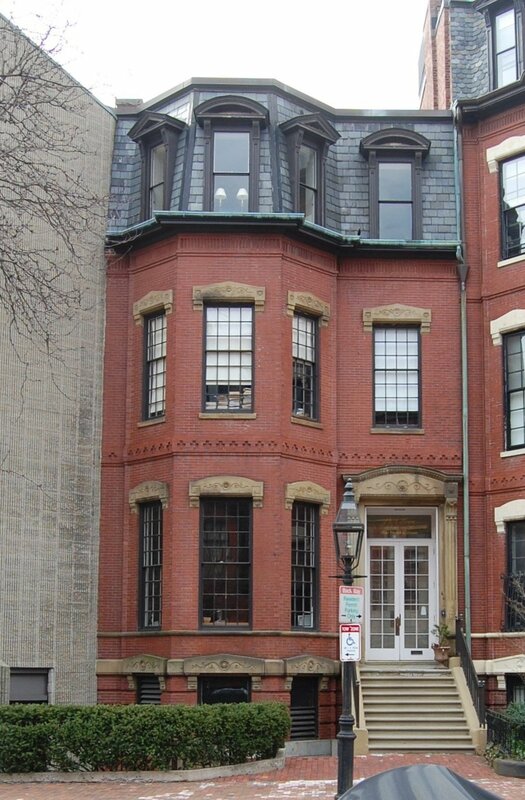 The Bryants continued to live at 66 Marlborough during the 1875-1876 winter season, but moved thereafter to the Hotel Brunswick (southeast corner of Clarendon and Boylston). On September 8, 1876, 66 Marlborough was acquired from Louisa Bryant by Dr. Israel Tisdale Talbot. He and his wife, Emily (Fairbanks) Talbot, made it their home. They previously had lived at 31 Mt. Vernon. Israel Tisdale Talbot was a homeopathic physician. He was a founder of the Boston University School of Medicine and served as its first Dean. Emily Talbot was a leader in efforts to promote higher education of women, and was a founder of the Massachusetts Society for the University Education of Women and the Association of Collegiate Alumnae. Their daughter, Marion, was a professor and Dean of Women at the University of Chicago. The Talbots continued to live at 66 Marlborough during the 1892-1893 winter season, but moved thereafter the Hotel Cluny at 543 Boylston. They continued to own 66 Marlborough and lease it to others. 66 Marlborough was not listed in the 1894 Blue Book. By 1895, 66 Marlborough was the home of Miss Sarah Alice Brown, who operated a school for young ladies at the house. She previously had lived and operated a school at 76 Marlborough. Her mother, Eliza Ann (Alexander) Brown, widow of Edwin R. Brown, and Miss Amelia L. Owen, a teacher in the school, lived with her (they both also had lived with her at 76 Marlborough). By 1900, they had been joined by Sarah Brown’s first cousin, Helen Alexander (daughter of her maternal uncle, Ewing Alexander); she was a nurse. 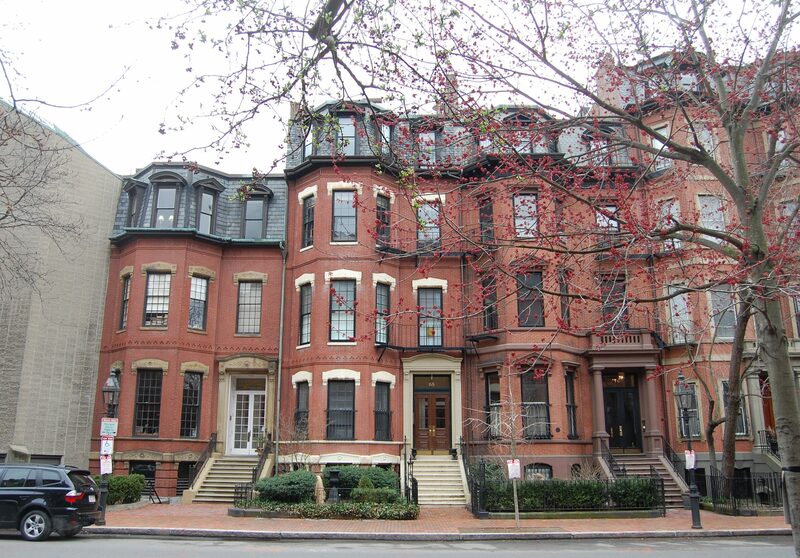 Also living at 66 Marlborough by 1900 were Winifred Alexander, a teacher in the school, and her brother, Thornton Alexander, a law student at Harvard. They were the children of De Alva Stanwood Alexander and were not closely related to Eliza Ann (Alexander) Brown. Eliza Brown died in November of 1900. Amelia Owens continued to live at 66 Marlborough until her marriage in July of 1901 to James Sullivan, also a teacher. Israel Tisdale Talbot had died in July of 1899 and Emily Talbot had died in October of 1900, and on September 17, 1901, Sarah Alice Brown purchased 66 Marlborough from Emily Talbot’s estate. Thornton Alexander graduated in 1902. He married in August of 1903 to Sarah Estabrook Galloway, a stage actress who performed under the name of Estabrook Galloway, and became a lawyer in California. Helen Alexander and Winifred Alexander continued to live at 66 Marlborough with Sarah Alice Brown, along with several other teachers in 1905, and probably later. 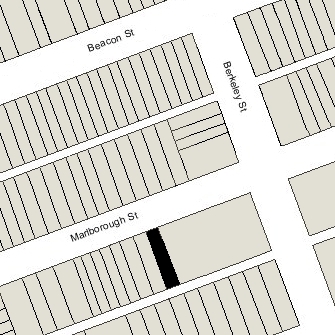 Miss Brown continued to live (and probably operate her school) at 66 Marlborough in 1913. On September 26, 1914, 66 Marlborough was purchased from Sarah Alice Brown by Margaret (McCulloch) Sturgis, widow of Russell Sturgis, Jr. She previously had lived at the Hotel Hamilton at 260 Clarendon. Her unmarried children, James McCulloch Sturgis and Lucy Sturgis, lived with her. 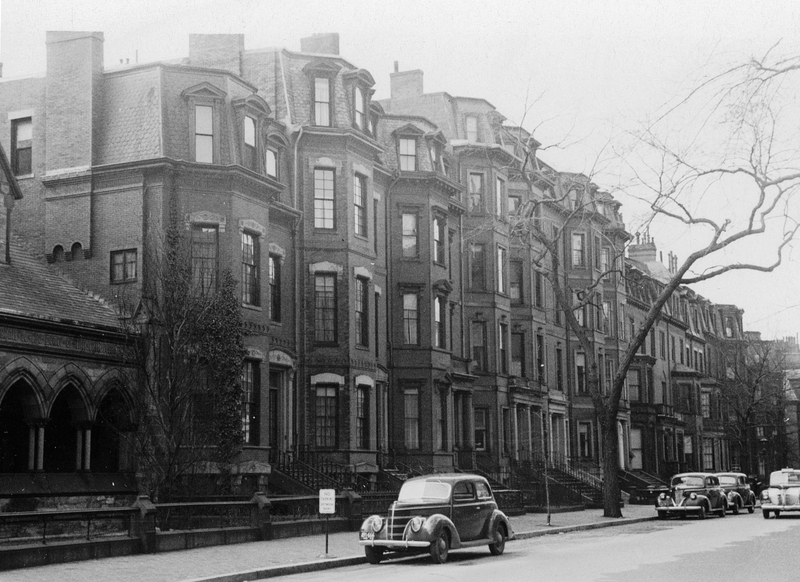 They continued to live at 66 Marlborough until Margaret Sturgis’s death in November of 1927. After her death, James McCulloch Sturgis and Lucy Sturgis moved elsewhere. On March 29, 1928, 66 Marlborough was acquired by Margaret Sturgis’s daughter-in-law, Edith Stuart (Barnes) Sturgis, the wife of Sullivan Warren Sturgis. S. Warren Sturgis was a Latin teacher at Groton School. After acquiring 66 Marlborough, they leased it to others for several years. By the 1928-1929 winter season, 66 Marlborough was the home of Charles Bernard Prince and his wife, Halldis (Möller) Prince. They previously had lived at 16 Charles River Square and before that at 190 Commonwealth. He was assistant treasurer of the American Tube Works. Charles Prince died in November of 1928, and Halldis Prince continued to live at 66 Marlborough until about 1933. She also maintained a home in Dover, Massachusetts. By the 1933-1934 winter season, 66 Marlborough was the home of Gordon Alfred Petremont and his wife, Dorothy (Parker) Petremont. He was sales manager for a chocolate company and she was a piano teacher. In 1933, they had lived at 90 Commonwealth. They continued to live at 66 Marlborough in 1935, but had moved to 285 Marlborough by 1936. In 1935, S. Warren Sturgis retired from Groton School and he and Edith made 66 Marlborough their home. Edith Sturgis died in 1940; S. Warren Sturgis continued to live there until his death in April of 1952. 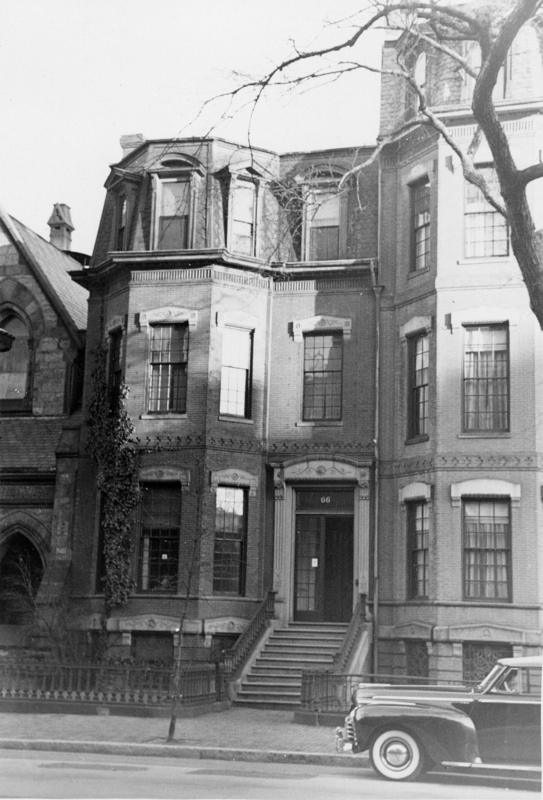 On October 29, 1952, 66 Marlborough was acquired from the Sturgis family by the First Church in Boston to become its parish house. By 1954, 66 Marlborough also was the home of Thomas Pym Cope and his wife, Elizabeth W. (Barringer) Cope. They previously had lived in Pennsylvania. He was executive director of the Unitarian Service Committee. They had moved by 1955. By 1955 it was the home of Chester A. Emery and his wife, Ruth (McDavid) Emery. They previously had lived in Wellesley. He was New England general passenger agent for the French Line. They continued to live there until about 1957. By 1958, 66 Marlborough was the home of Frank Mansfield Young, an acoustical engineer, and his wife, Jean (MacKenzie) Young. They had lived in an apartment at 195 Beacon in 1957. They continued to live at 66 Marlborough until about 1963, but had moved to 39 Beaver Place by 1964. In 1972, 66 Marlborough became the location of the John Winthrop Nursery School, which had been founded in 1966 by members of the First Church. 66 Marlborough continued to be the John Winthrop School for Young Children and the First Church parish house in 2015.